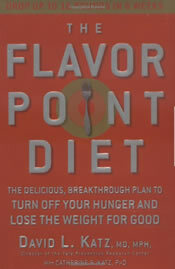 Dr. David Katz, director of the Yale prevention research center, created The Flavor Point Diet. It is based on medical and behavioral research that suggests that limiting the variety of different flavors in a meal reduces the tendency towards overeating. Each type of food is thought to stimulate different appetite centers in the brain. Once a specific appetite center is stimulated it will then remain active until the point of satisfaction of that particular flavor is reached. In this way too much food variety can lead to overeating because there are many appetite centers that are demanding to be satisfied at the same time. Experience has shown that dieters reach the point of satisfaction earlier when meals are less complicated. By utilizing the concept of simple meals with single food groups the Flavor Point diet promises that dieters will be able to lose 9-16 pounds in 6 weeks. This phase is followed for the first four weeks. It is designed to reduce cravings caused by over stimulated appetite centers in the brain by using a specific flavor theme each day. Examples of flavor themes include lemon, cranberry, peach, thyme and mint. By combining and limiting foods based on their flavors it is possible to trick the centers in the brain that regulate appetite. This phase is followed for weeks 5 and 6 and allows for an increased variety of flavors with fewer rules. Phase 2 involves a flavor theme for each meal rather than for the entire day. Dieters are advised to remember not to combine sweet and savory flavors in the one meal. This is the maintenance phase of the diet where dieters may design their own meals based on the basic principles of the plan. For dieters who would like to maximize weight loss the meal plans have a ‘weight loss express’ option that allows for a reduction of calories by eating less at each meal and skipping dessert. Fresh and whole foods are recommended and dieters are advised that commercial foods have hidden flavors that can over stimulate the appetite and lead to overeating. These foods should be avoided completely. Dieters are also advised to always start dinner with a green salad and to have a hot beverage after lunch and dinner to help promote the feeling of fullness. Look for more meal ideas here. Half an hour of exercise is recommended daily with a combination of aerobics and muscle toning exercise. These exercises can be used with the Flavor Point Diet. The Flavor Point Diet retails at $24.95. Includes a wide variety of healthy foods. Simple to understand and easy to follow. Provides six weeks of meal plans and recipes. Does not require dieters to eliminate their favorite foods. Concepts are supported by scientific research. Requires a fair amount of time spent on cooking and food preparation. Recommends some food items that may not be easy to obtain. The six-week plan is quite rigid. Promises rapid weight loss that may not reflect true results or long-term effects. The initial phases of the plan are highly restrictive in regards to food choices however as dieters progress and their appetite centers are regulated the plan becomes much more flexible. Although dieters have a limited selection of food choices on any individual day, the days are rotated so that the overall dietary pattern is balanced and includes a wide variety of foods. The basic principles of the diet are simple so that dieters may create their own approach without strict adherence to the meal plans once the general concepts are understood and absorbed. Many of the benefits of this diet may come from the guidelines that advise completely eliminating processed foods, however as dieters learn to appreciate the simplicity of the flavors of fresh and wholesome foods there will be a natural tendency to select more a health promoting and weight regulating dietary pattern. This dietary restructuring is quite likely to yield long-term results for those who are effectively able to apply this approach in the context of their daily lifestyles.